« Pumpkin Pie, Need I Say More? It took three trips to the Gothic quarter of Barcelona before I found La Boqueria. Granted, the first two were evening dinner forays where I simply explored the old city and enjoyed tapas and gelato and cava with a wandering eye that did not land on the market. I knew I had to make a dedicated trip to find the ancient market because my friends were insistent that it was a must-see on my trip to Barcelona. So glad I made that third foray! La Boqueria is simply astounding, a covered market with hundreds of vendors. It dates to the year 1217 when farmers sold their produce on the outskirts of the old gated city. The current structure was built in1840. Today’s vendors artfully arrange their goods, a feast for the eyes to tempt the belly. Each vendor has its specialty. Spices sold by the kilogram. Eggs sized from tiny quail eggs to softball-sized emu. Iberian ham stalls where the butchers patiently explained the origins of the much-coveted pork while carving paper-thin slices. Pate stands. Beautifully packaged salt flavored with provencal herbs or chilis or lemon. And of course more veg and fruit stands than you could count. These vendors know their tourist audience. They package many items for people on-the-go: papayas halved and wrapped with plastic with a tiny spoon, paper cones filled with jamon ham slices or cheese wedges, plastic cups of colorful fresh-squeezed juices chilled on ice, skewers of all combinations, and empanadas to eat out of hand. At 10 am, people were bellied up to a handful of tapas bars within the market, sitting at counters to watch the creation of their small plates. And what I really loved was the little old Spanish ladies doing their daily marketing, nimbly navigating the narrow passages and towing a small cart to stow their purchases. 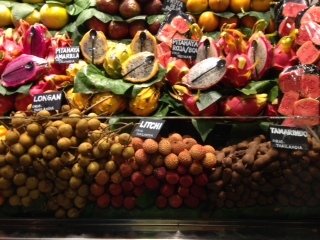 La Boqueria is a ‘supermarket’ for the ages.